It’s Thursday and I’m Tired! Looking for Rumpy, are ya? Well, here I am! Yeah, I thought I’d sleep in this morning. Today is the last day to get in on the Kong Premium Treats giveaway! Don’t forget to get your name in the hat. There will be THREE prizes awarded, so your odds are mighty good! You still have time to get in on Peggy Frezon’s giveaway of her book, The Dieting With My Dog Guide to Weight Loss and Maintenance. Don’t miss out! So now, if you’ll excuse me, I think I’ll head back to bed while Jen gets ready for work. Oh, what a life I lead! « Weirdo Wednesday: Nothin’ Normal ‘Bout Rumpy! I’m tired too. Mom has us up so very early today, not good. Whee are having a lazy day too. One of the little hoomans has been ill so whee are snuggling him better. Rumpy, sometimes we need lazy lazy days! WOoooowoooooo! Meow Rumpy! My staff slept late. Well, sort of. She got up just long enough this morning to give me my insulin shot and kibble, and then went back to sleep. Since I am her nurse cat, I stayed on her bed with her and purred. 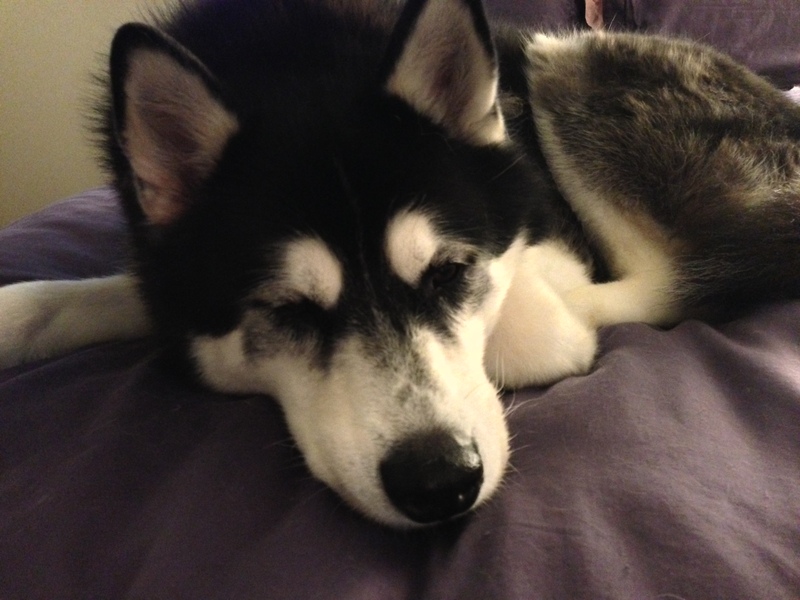 My staff says she likes Malamutes, too, especially ones with proper masks like you! take a nap and rest up! Sometimes you just need to chillax! !